Distinguished by its updated sensor design, the Alpha a7 III Mirrorless Digital Camera from Sony is a well-rounded camera body suitable for not only unmatched photography, but high quality video applications in a variety of working situations. 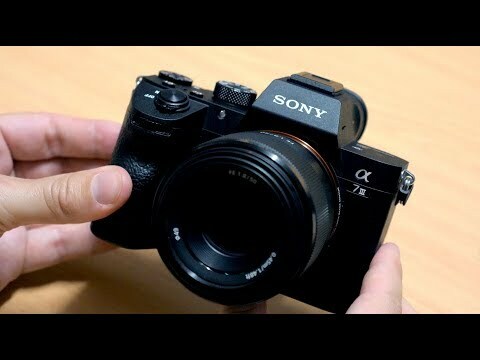 The body only option of the Sony a7 III mirrorless digital camera allows users to tailor their equipment based on their own specifications. Refined for improved speed and low-light performance with mirrorless technology, the full-frame 24.2MP Exmor R BSI CMOS sensor and BIONZ X image processor from the inimitable Sony pair to realize an impressive 10 fps continuous shooting rate and improved autofocus performance for faster, more reliable subject tracking along with wide frame coverage. This updated Fast Hybrid AF System employs a combination of 693 phase-detection points and 425 contrast-detection areas for quicker acquirement of focus in a variety of lighting conditions, and also maintains focus on subjects more effectively. In addition to speed and AF, the processing improvements also help to realize greater image clarity and reduced noise throughout the sensitivity range from ISO 100-51200, which can further be expanded to ISO 50-204800. Video recording capabilities have also been extended for enhanced quality when recording UHD 4K video with the full width of the full-frame sensor to minimize moiré and aliasing. Additionally, benefitting both stills and video operation, the a7 III utilizes a 5-axis SteadyShot INSIDE sensor-shift image stabilisation, which is now effective to minimize the appearance of camera shake by up to 5 stops. Featuring a back-illuminated design, the full-frame 24.2-megapixel Exmor R CMOS sensor works with the BIONZ X image processor to offer high-resolution stills and video while minimizing noise and improving speed. This sensor structure works with gapless on-chip lens design and an anti-reflection coating, as well as eliminating the optical low-pass filter, to improve light collection and enhance detail. Also, the copper wiring layer dramatically improves data transmission speed for creating 14-bit, high-resolution stills with a native sensitivity range from ISO 100-51200, which can be further expanded to ISO 50-204800. Also, it enables internal UHD 4K video recording with a wide dynamic range using the full width of the full-frame sensor. The BIONZ X processor also works in conjunction with a high-speed front-end LSI to realize faster processing times along with the ability to capture an impressive 15-stop dynamic range at low sensitivity values to deliver only the high quality digital images expected from Sony’s mirrorless camera range. The apt focus system also lends itself to a variety of focusing functions for refined accuracy, including Lock-on AF, which maintains focus on moving subjects throughout the use of a configurable frame that is set over the desired moving subject, and Expand Flexible Spot, which employs neighbouring focus points to retain focus on moving subjects even if the originally selected point loses focus. Additionally, Eye AF can be used to base focus on recognized subjects' eyes for portraits and is available in both AF-S and AF-C modes. Autofocus can also be used in conjunction with the Focus Magnifier function for critical focus when homing in on minute subject details. The rear touchscreen can also be used for Touch Focus control, and a Touchpad Focus Control mode lets you use the rear screen intuitively while keeping your eye to the viewfinder. Packed into the robust a7 III is a 5-stop effective 5-axis SteadyShot INSIDE image stabilisation system that compensates for five different types of camera shake encountered during handheld shooting of stills and video. This allows users to confidently use any lens, even adapted lenses, for critical imaging without encountering blur from camera shake. For long focal lengths, the system will correct for pitch and yaw adjustments. Macro and high-magnification imagery, on the other hand, will benefit from the inclusion of horizontal and vertical shift compensation. All shooting styles will get usage out of the roll compensation. All 5 axes of stabilisation will function at all times, even when used with third-party lenses and adapters or lenses with built-in optical stabilisation. Affording extensive customizable colour and gamma controls, the a7 III allows users to adjust the gamma, black level, knee, colour level, and more. Also, users can use the same S-Log2 Gamma Curve that is found on high end Sony Cinema cameras that squeezes up to 1300% more dynamic range into the video signal then traditional REC709, for increased post-production flexibility. HLG (Hybrid Log-Gamma) support is also available, along with the BT.2020 colour space, for recording within a wide colour gamut and, in addition to S-Log2, S-Log3 is also available for producing an effective 14-stop dynamic range with increased grading control in the shadow to mid-tone regions of the image. In addition to the EVF, a 3.0" 922k-dot rear LCD is also available, which has a touch panel design for intuitive operation and focusing control. The screen also tilts upward 107 degrees and downward 41 degrees to benefit working from high and low angles.